How might we more sustainably use water, waste, energy, transportation or food as individuals, on campus or in our community, country or world? What solutions can you prototype using things like data science, entrepreneurship, 3D design and printing, and the internet of things? At the beginning of the Make-a-thon weekend, each team chooses a challenge theme/subject to address and narrows in on a specific scale such as individual, campus or community. For example, a team might choose to create a solution that helps individuals reduce personal water use or that helps the community incorporate more sustainable food practices. Make-A-Thon is open to any NC State student. Participants will be on three- or four-person teams. Students form their own teams. If you need help finding teammates, a Slack Channel has been created to help participants connect with others looking for teammates. Please use Slack (how to use Slack) or other means to form your team before registering for Make-a-thon. Registration for the event begins November. What skills do I have to have to participate? A think and do attitude is all that’s required. A true interdisciplinary event, Make-A-Thon brings together students with all kinds of backgrounds and skills. Some code. Some design. Some write. These diverse perspectives and skills will enable unique solutions to campus sustainability challenges. Bring whatever skills you have. Collaboration will take care of the rest. No, Make-A-thon isn’t a lock-in and we know that 48 hours is a long time. If you have other commitments during the weekend, feel free to take a break from Make-A-thon. You can stay and leave as you choose, though it’s more fun if most participants participate in most of the event. The big takeaway is this: don’t not sign up for Make-A-thon just because you can’t be there the entire weekend. Talk with your team, divide up responsibilities accordingly and figure out how to carry each other’s loads. It’s good real-world experience. One big request is that at least half of your team be present for Sunday afternoon judging and awards. A lot of planning goes into making this event a reality, and Sunday afternoon is the culmination of a lot of hard work. We want you to be there to be part of the celebration of your creativity. Why, of course! Our website will be updated with prizes as they are determined. I’m not a coder or a designer. Will that matter? You don’t have to be a coder or a master of all things technology. It’s likely that someone else on your team may have skills in that area. Plus, we’ll have training sessions and mentors/experts around to help you. Of course! Free food and snacks are on us. What’s the event entail? Do you have an event schedule? Here’s what the 2019 competition was like: Make-A-Thon begins on Friday evening. We’ll have dinner, a brainstorming session and more details about event logistics, etc. You also have the opportunity to talk with subject mater experts and experts in tools/techniques/resources that might be helpful for your solution-making. From there, you’ll be off and running to develop your sustainability solution with your team. On Saturday, we’ll block off a huge part of D.H. Hill just for Make-a-thon teams to collaborate, connect with mentors and fuel up with snacks and dinner. You have until Sunday morning to submit your solution for judging. Our panel of industry leaders and other experts will begin combing over proposals beginning after noon on Sunday. You’ll have the opportunity to pitch your ideas to judges and answer questions. By mid-afternoon, we’ll announce the winning teams and start awarding prizes. Registration will be available on this web page beginning November. Do I have to register as an individual or a team? You register as a team. Teams must consist of three or four people, and at least two of those people must be from separate colleges within NC State. If you already have a team formed, you will be able to register as a team. If you have a partial team formed (for example, you and your roommate) or it’s just you, no worries. We’ve set up a channel on Slack (how to use Slack) so that you can find others looking for teammates. A laptop is suggested but not required. A reusable bottle will help us reduce event waste, so if you have one, toss it in your backpack as well. Sponsors make Make-a-thon possible. Make-a-thon sponsorships are tax-deductible to the extent allowable by law. Make-a-thon is a program of North Carolina State University, a 501(c)(3) organization. Contact Chester Miller at clmiller@ncsu.edu for more information about sponsorship of the 2020 event. Mentors engage directly with participants, guiding students to create the best possible solutions. You can sign up as a representative from your company or organization or as an individual who loves the idea of giving back and helping students Think and Do. Make-a-thon judges have the reward of hearing and seeing the outcome of student projects, plus the responsibility of selecting winners. Experience in sustainability, design or entrepreneurship is preferred but not necessary. Past Make-A-Thon participants talk about the competition and its impact. GRAND PRIZE: The team who won the grand prize used piezoelectricity to create floors that capture and store energy. Each member of the winning team received a Desktop 3-D Printer and Starter Kit. GRAND PRIZE: The winning idea is for a bike-share program that uses existing campus bicycles and infrastructure. Each member of the winning team received a Desktop 3-D Printer and Starter Kit. The team also won a consulting session with Aly Khalifa, NC State’s social entrepreneur in residence, and gift certificates for free fabric poster printing from Spoonflower. 2ND PLACE: The winning idea is a app-based surge protector for outlets that results in reduced phantom load. Each member of the team received a SparkFun Tinker Kit, a $100 Shapeways 3D printing credit and a gift certificate to Spoonflower. BUILT ON CLOUD PRIZE: The winning idea is a trash can attachment that notifies a user if a recyclable item is thrown away. IBM donated $1,000 cash to best cognitive cloud solution that utilizes Bluemix. FUSION 360 PRIZE: The winning idea is a modification to residence hall trash chutes that will accommodate recycling. Autodesk donated Space Mouse and digital caliper for each member of team that best utilizes Fusion 360 design software. 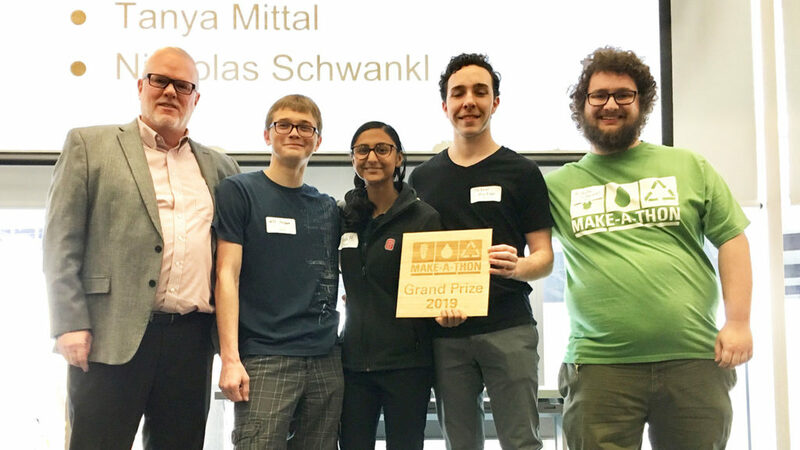 SOCIAL MEDIA PRIZE: The winning team chronicled the development of a water-saving showerhead device.